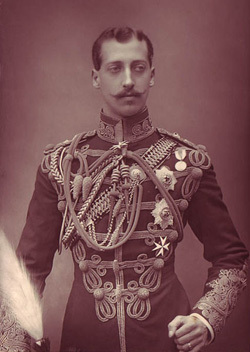 Prince Albert Victor, "Eddy", in full princely plumage. Regular readers will be aware of the campaign to save the Cleveland Street Workhouse. But back in 1889, Cleveland Street became notorious for a scandal that involved the very upper echelons of Victorian Society, including – according to some – the strange-looking prince, Albert Victor, a man who would certainly have become king had his life not been cut short in 1892, aged 28, during the great influenza pandemic. “Eddy” to his nearest and dearest, was the eldest son of the Prince of Wales, hence Queen Victoria’s grandson. He was engaged to Princess Mary of Teck, who went on to marry his younger brother, later George V.
In 1889, a gay brothel at 19 Cleveland Street got busted by the police, led by Detective Inspector Frederick Abberline. What led to the bust was a routine investigation of theft at the General Post Office. Under questioning, one of the GPO clerks confessed that he also moonlighted as a rent boy at a brothel in Cleveland Street. It soon emerged that the GPO was a rich recruiting ground for clerks who were willing to earn something extra outside of working hours. Brothels, gay or straight, were ten a penny in the Victorian era. What made this story different was the alleged clientèle of the Cleveland Street establishment. The Duke of Somerset and the Earl of Euston were the only aristocracy actually named, along with an obscure army colonel. Somerset fled the country, but Euston successfully sued reporter Ernest Parke of the North London Gazette, who received a 12 month sentence. The question is whether this was a greater scandal than it appears, or whether we should take it at face value. The suspicion is that there was a closing of ranks among the Establishment on the grounds that: the story was not much covered in the mainstream press until the trial; the two rent boys who were prosecuted were given inordinately light sentences (under a year each, half the norm for these type of convictions); lack of effort to have Somerset either extradited or prosecuted, indeed the Prince of Wales himself attempted to have charges against Somerset dropped. And Prince Albert Victor? He was never officially named as a visitor of the brothel, but Arthur Newton, the defence lawyer of Somerset and two of the rent boys is thought to be the rumour monger who acted to draw attention away from his clients. Most reputable historians dismiss totally the idea that the prince was in any way involved and certainly private correspondence among his friends and relatives vigorously attest to his heterosexuality. His reputation was impugned during the first half of the 20C by press and historians alike, but all based on circumstantial evidence or impressions, chiefly his rather fey appearance and personality. During his lifetime he was very popular in public and mostly in private too, and his death caused a huge outpouring of genuinely-held grief (his former tutor starved himself to death!). Irrelevant Albert Victor fact: with his pa, he opened the beautiful Hammersmith Bridge, designed by Joseph Bazalgette, in 1887. I’m aware that this post has transmogrified into an item on Prince Eddy, I hope none the worse for that. Wikipedia has much more on the Cleveland Street scandal, nicely covered, here. Most other accounts appear to be plagiarised almost word-for-word either from Wikipedia or a common source elsewhere. “strangel-looking prince…”. What makes you think that? To me, this man’s picture resembles very much the images we get to see of other males of the period. Odd. Per his uniform and ‘tache, I totally agree. But otherwise, with his olive skin and hooded eyelids, he looks exotic and eastern, and not like a Northern European prince at all, that is to say pasty-skinned and bearded. I believe his detractors possibly superficially picked up on this too. There are more pics of him on his Wikipedia entry. I suppose it would not be beyond the bounds of possibility for the prince or any of his chums to be bisexual or “bi curious”, as people often describe themselves on encounter sites today. In that case, evidence of a vigorous heterosexual lifestyle would not be a defence against accusations of homosexual adventures. In the account on Wikipedia there is certainly more than a hint that a person of high station is being protected though there is no proof of the identity of such a person. The death of the prince from influenza is another case where we might wonder how differently history might have turned out if things had been only slightly changed, for example if flu vaccine or modern medical care had been available. We can never know the answers to such questions. My knowledge of sexuality and society historically is scant to say the least. It seems, though, that gay Victorian men maintained conventional married home lives (e.g. Wilde) – often with plenty of offspring – while pursuing extra-curricular jollies secretly and known only by their inner circle, who were generally protective. I believe that attitudes were far more forgiving in Elizabethan and early Jacobean period (though nonetheless illegal). Interesting that Albert Victor and those associated with the scandal had close connections with the Liberal Party as did those with the Beauchamp business a generation later. Not sure to what extent or whether this means that these matters ran along party political lines. There is an intriguing story (retailed by the Camden History Society in their Streets of Bloomsbury and Fitzrovia as fact) that Prince Albert Victor had an affair with Annie Elizabeth Cook or Crook, who worked in a tobacconist’s in Cleveland Street, married her in secret and had a daughter by her. According to this tale, because she posed an obstacle to a more fitting royal marriage (and was a Catholic! ), she was incarcerated in a mental institution (and possibly operated upon to remove her memory!) and Mary Kelly, a friend, who was nanny to the daughter, fled with the child but was later murdered by Jack the Ripper. I think this story is almost certainly a fabrication, pace the Camden History Society, and was seized upon by later authors seeking a connection between Prince Albert Victor and Jack the Ripper, trying to prove either that he was the Ripper or that the Ripper’s activities were intended to erase all traces of the inconvenient marriage to a commoner. Was aware of Ripper murmuring in relation to Albert Victor, but always make a point of giving all Who Was The Ripper matters a very wide swerve. Ditto Dan Brownish Templar and Masonic claptrap! Joke: Everyone has a good book in them. Except Dan Brown. I must make a visit to Camden Hist Soc event again soon. The man involved in the Cleveland Street Scandal was Lord Arthur Somerset (son of the Duke of Beaufort) NOT the “Duke of Somerset”!! Ah, thanks for that, quite right. Peerage is a minefield, one must be on one’s mettle and I fell short on this occasion! Do you have any information about the numbering of buildings on Cleveland Street at the time of the scandal compared to today? I can’t seem to find a straight answer about whether the 19 Cleveland Street of 1889 still exists or not. The difficulty is that the street has been renamed and renumbered several times. I have only researched the Dickens house. 22 is on the east side (the right if you’re facing north, looking from Goodge Street towards the Telecom Tower) so if the street was numbered in the way most London streets were numbered after 1860, odds on one side, evens on the other, number 19 would have been on the left, ie: the other side of the road, which was obliterated in the 1920s when the Middlesex Hospital was rebuilt. All the houses & shops along that side of the road (the west side) were demolished at that time so that the new Middlesex Hospital’s wards could have a larger footprint. And of course that wonderful Hospital has now been obliterated too. To confirm that what I have said is correct, however, you would need to visit Westminster Archives, as both sides of the road (the whole of the old Norfolk Street) was in Marylebone, which has since been absorbed into Westminster. If you want to be sure of information, you have to research it yourself. Thanks, Ruth, great answer. I was going to suggest Westminster Archives, too. Did you know I was trying hard to contact you last year via all sorts of routes and means? Many LH members have seen you or bumped into you or met you subsequently, it’s crazy, hope to meet you sometime too! Justin, hope this is all okay for you. Thank you for the replies. Yes, this information is great. I visited London recently and was sorely disappointed that what would currently be 19 Cleveland Street is a construction site, but after a little digging it looked as though the site might not have been one and the same with the 1889 numbering, so I was, naturally, confused. This post and comment thread have been helpful.